Although Thurston method of preparing attitude scale was the first successful effort in the field of attitude scaling, but the method introduced by Likert is considered more useful for its easiness. It takes a very less time and effort to prepare attitude scale by Likert Method, along with this, there is no need to know the scale value of the statements by rescaling them from experts, but by getting the responses only from the people, the statements are selected. The evaluation of received scores is also very easy in Likert method, and the results received are also legal and reliable. 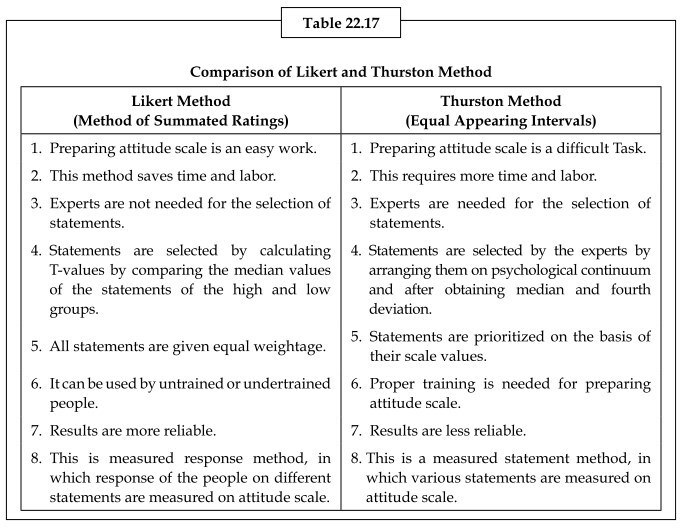 A comparison of Likert and Thurston Method is given in the following Table 22.17. Except the above explained, Couple Comparison Method, Equal Appearing Intervals Method and Summative Rating Method, some other methods are also developed for preparing attitude scale. These are described in brief in the following lessons, and for a deep study of it, interested students can get a vast knowledge from the literature available on preparing attitude scale. It was accepted in Equal-Appearing Intervals method of preparing attitude scale, that there is an equal interval between the points on psychological continuum, but this never happens actually. It was found during obtaining the theoretical relation between scale values received on the statements, through Couple Comparative Method and Equal Interval Method, on both the ends on psychological continuum specially, that the statement situated on both the ends on psychological continuum, the scale values received through Equal Interval Method had less influence as compare to Couple Comparative Method, while the scale values received from other statements from both the methods had linear relation. It was also desirable in this type of situation to invent a new Scaling Method, which should be as easy as Equal-Appearing Interval Method, and can give the scale values as same as received from Couple Comparative Method, having linear relations on total continuum. Therefore many methods were developed which can remove the disparities of intervals on the psychological continuum. The method of successive intervals developed by Thurston, but not published, was published in 1937 by Safeer. Method of Absolute Scaling by Guilford in 1938, Method of Graded Dichotomies Attneave in 1949, and Method of Equal Discriminability by Garner and Hake in 1951 presented these methods, with slight differences. Nowadays, all these methods are known as Method of Successive Intervals. Actually, Method of Successive Interval is a converted form of Equal-Appearing Interval Method, in this method every Judge has to give one separate judgment on each statement. Therefore, this method is easy to use only in that condition, when the number of statements is more. Any psychological continuum like Eleven Points, Nine Points, and Seven Points can be adopted in this method. After arranging the statements in a sequence on different psychological continuum categories by experts, the scale values are known with the help of cumulative ratios. After that, the attitude scale is prepared through Equal Appearing Method, by selecting appropriate statements, and also the implementation and scaling is same as in Equal-Appearing Method. Actually, Scalogram Method is not a method to prepare attitude scale, but it is a method to evaluate attitude scale, in which this is known if the given attitudes scale, is according to a special type of attitude scale studied by Gutman. Gutman said that if an attitude scale or a set of statements is scaling an attitude, means if it is a unidimensional scale, then on this attitude scale, a person getting maximum scores, will get either more scores or equal scores, as compared to any other person getting less scores, on all the statements of the scale. If this scale fulfills all the conditions, then it can be known as Cumulative Scale or Gutman Scale. The responses on the statements are analyzed on a scale in Scalogram Analysis, and it is observed that up to which limit, responses are being analyzed and up to which limit the attitude scale fulfills the conditions of Gutman Scale. For this IOR (Index of Reproducibility) is calculated. IOR, actually, expresses that particular limit up to which, only through the total marks secured on scale, the scores can be reproduced for different people on different statements. Gutman not described any kind of specific method for preparing his cumulative scale, and said that on the basis of experience and insight, statements can be selected. He also mentioned to take care about homogeneity, while selecting statements. Edward and Kilpatrick developed a method of preparing attitude scale in 1948 named Scaled Discrimination Technique. In this method they tried to select those statements through the Equal Appearing Intervals Method of Thurston, and Distributive Method of Likert, which can fulfill all the condition of Gutman Scale. The steps of preparing attitude scale by Scales Discrimination Method are same as in Equal-Appearing Interval Methods, first of all many psychological statements are collected and composed very carefully, after that with the help of Equal Appearing Method, the value of Q is known, and the statement having more Q values, near about 50%, are rejected, and the rest 50% statements are applied on a very large group of people in the form of Likert Scale, and for every statement discrimination value is known. Edward and Kilpatrick used Phi-Coefficient to know discrimination value. To known Phi-Coefficient, on the basis of response frequencies by people of High or Low Group are categorized in two categories – Lower and Higher Group. 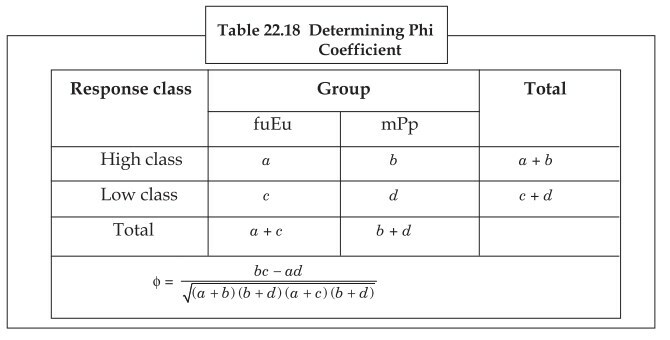 Phi-Coefficient can be calculated by arranging the frequencies according to Table 22.18. To divide the responses in high and low Groups for different statements, the values of (a + d) are tried to minimize. In other words the responses are combined in such a way that the minimum value of (a + d) should be received, Nomograph can be used to know Phi-Coefficient. After calculating phi-coefficients for all the statements, considering the scale values by Thurston and phi-coefficients, the statements is selected finally. The selected statements are given the form of arranged attitude scale arranged according to their Thurston scale values. This attitude scale can be applied on exercisable, in which people have to express their agreement and disagreements limits according to Likert Method. For calculating the responses on any statement, according to the process prepared for knowing phi-coefficient, for minimum response category, mark 0, is used and for high response category mark 1 is used. Attitudes are very important part of the personality of a person. The appropriate valuation of Attitude could have been started 60 years before, approximately. In the earlier time attitude was scaled through Direct Questioning and Direct Observation Methods. By keeping in mind the limitations of these methods psychologist formulated scaled methods. These scaled methods can be divided in two main parts, Scaled Statement Method and Scaled Response Method. In the present time, Likert’s Summative Rating Method, which is a Scaled Response Method, and Equal-Appearing Interval Method of Thurston and Chave, which is a Scaled Statement Method, are very much in use, and the maximum available attitude scales at present are prepared by both of these methods. Like any other scaled process, for preparing attitude scale, four main steps are followed (1) Planning about Scale (2) to prepare Attitude Statements (3) to select Attitude Statements (4) to ensure the reliability and legality of attitude and to know the medians. In the first step of preparing scale, nature of scale, number of statements, language of attitude, are considered. In the second step, attitude statements are collected and composed through different sources. In the third step appropriate statements are selected, and to select statements, Couple Comparative Method, Equal-Appearing Interval Method, Summative Method and any other method can be used. Mostly for selecting statements Equal-Appearing Interval Method of Thurston and Chave and Summative Rating Method of Likert are used. Likert’s Summative Rating Method is mostly used in both of these methods, due to its easiness. In the fourth step of preparing scale, reliability and legality is known with the help of selected statements, and the list of values is prepared.